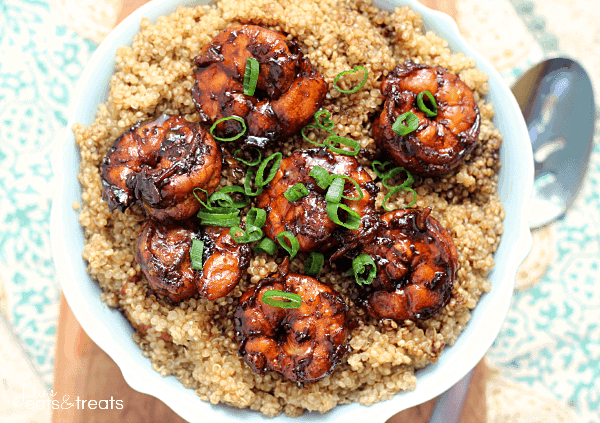 Zesty Sriracha Shrimp & Quinoa ~ On the Table in 20 minutes and Loaded with Flavor! 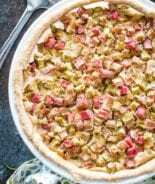 Sometimes I like to get out of my “bubble” in the kitchen a try out a new ingredient or dish that isn’t so “familiar” to my family! 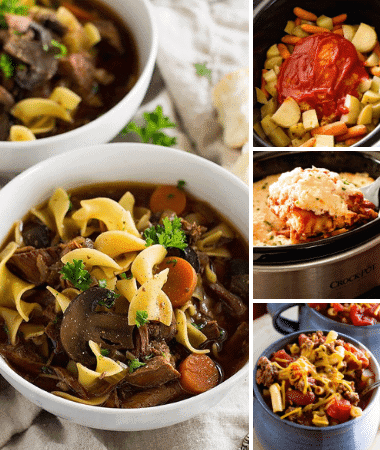 Like the Crock Pot recipes, comfort food, casseroles or sweets. 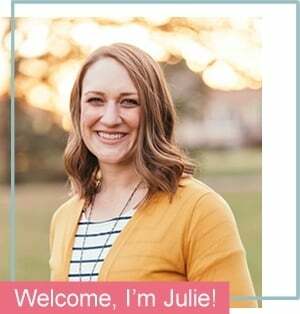 When OXO contact me to be part of the “Shrimp Showdown” hosted by OXO and The Shrimp Council I knew this was the perfect way to try something new and exercise my creative powers in the kitchen! Best part of this like Showdown? I got 5lbs of shrimp shipped straight to my doorstep! Part of getting out my bubble included learning how to peel and devein my shrimp. 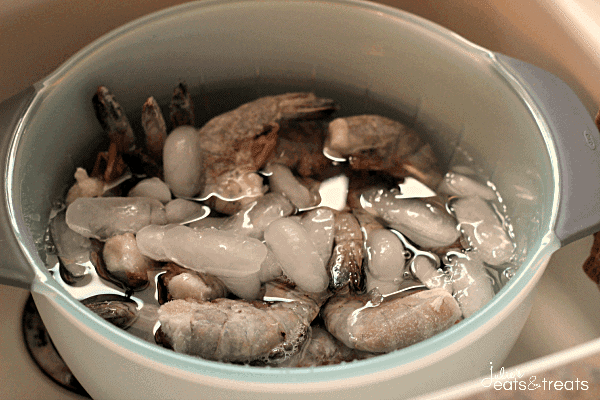 First I learned that I wanted to keep my thawed shrimp cool and on ice. I stuck them in my OXO 3 Piece Bowl and Colander Set and it worked perfectly! With the helpful aid of the OXO Shrimp Cleaner it was so simple so peel and devein the shrimp! This is a must have whenever you peel and devein shrimp I quickly learned! It only took a few minutes and each shrimp was done! When you have 5 lbs of shrimp you need efficiency that’s for sure! For my shrimp dish I made Zesty Sriracha Shrimp and Quinoa. Since I was getting out of my bubble I decided to go all the way. I had quinoa and hadn’t tried it yet along with Srirach so this was the perfect time to incorporate both of them into a new recipe! I wasn’t disappointed that’s for sure. I know both will become staples in my recipes from now on so I hope you like them too! 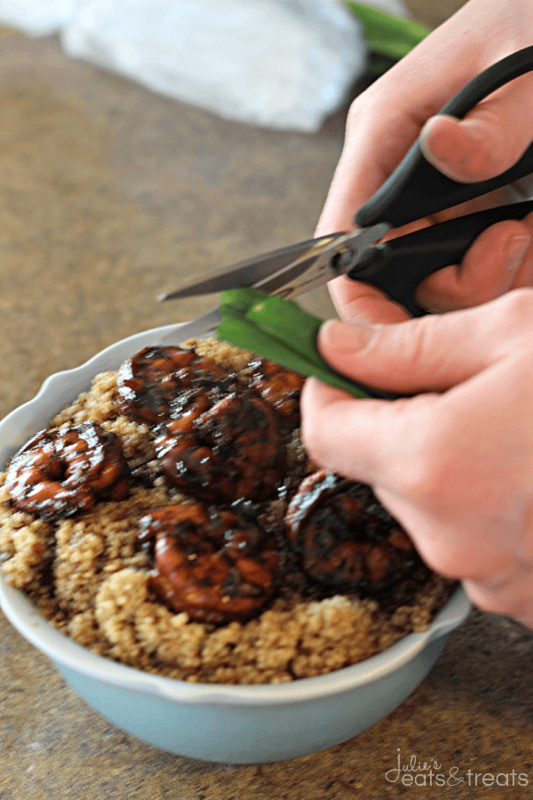 To add the finishing touches to the dish I grabbed my OXO Flexible Kitchen & Herb Snips and topped the Zesty Sriracha Shrimp and Quinoa with a few green onions. The perfect finishing touch! Don’t you just want to head dive into that bowl? I know I do! 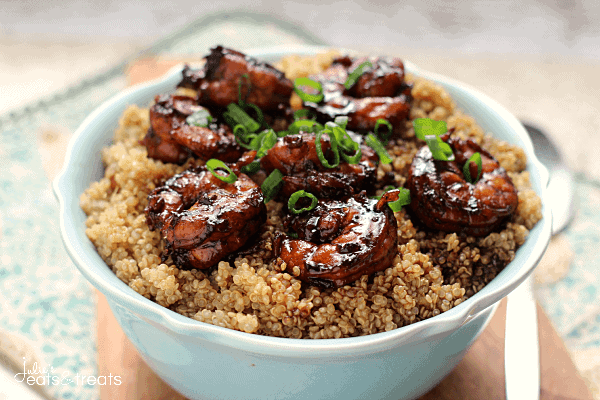 Quinoa and shrimp bathed in an amazing balsamic sriracha sauce is called perfect. Plus it’s on the table in twenty minutes, which is a must in my book. I don’t have time to get all fancy and slave over a recipe for hours. The best part is that no one would think it was so easy. It looks like you did slave for hours. Don’t worry it will be our little secret! In a medium sized bowl combine soy sauce, balsamic vinegar, pepper, garlic and sriracha. Stir until well blended. Set aside. In a large pot combine quinoa and chicken stock. Bring to a boil, cover and reduce to a simmer for 10 minutes or until the quinoa is cooked and tender. Remove from heat and set aside. While quinoa is cooking, heat the sauce in a frying pan over medium heat. Add shrimp to pan. When the shrimp is cooked through and the sauce has reduced so it's thicken add quinoa and stir until well combined. 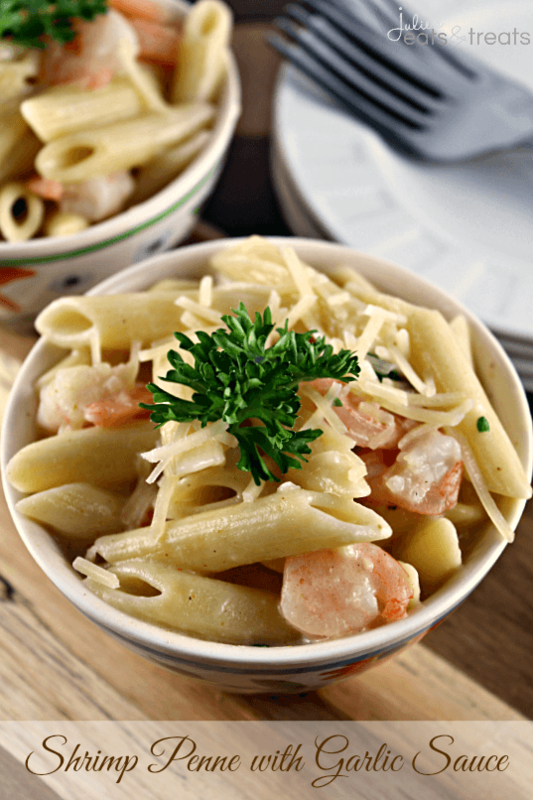 Shrimp Penne with Garlic Sauce ~ Amazing and easy plus it’s lightened up! 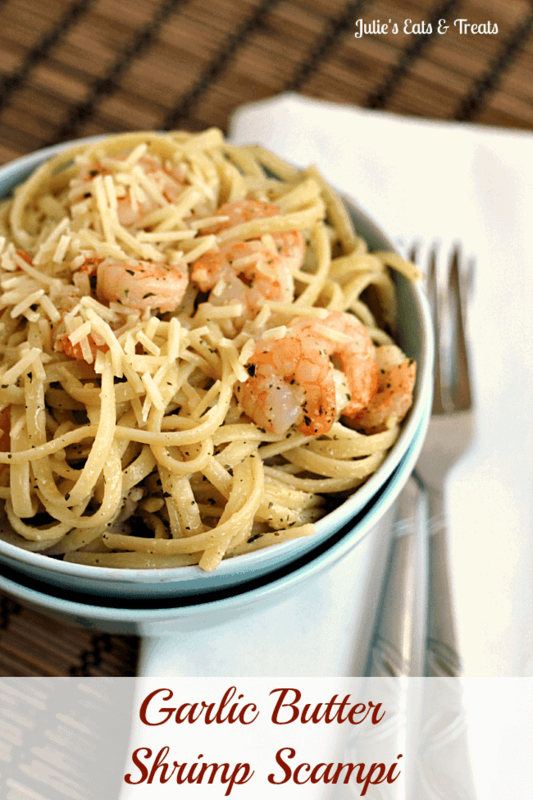 Garlic Butter Shrimp Scampi ~ Easy, homemade supper perfect for the weeknight! 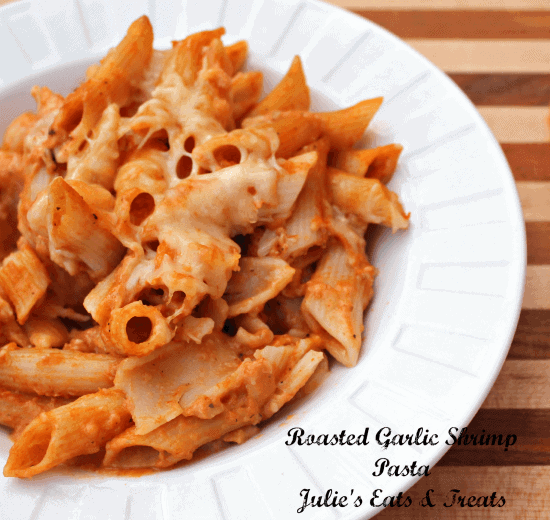 Roasted Garlic Shrimp Pasta ~ Easy pasta smothered in a marinara garlic sauce and loaded with shrimp! 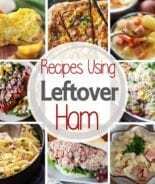 Just tried this recipe and it’s just too salty. Sadly, I won’t try it again. Made this recipe tonight and decided to go with 1/4 cup of soy sauce, thinking that 1/2 cup was too much. Despite reducing the soy sauce it was still too salty for my liking. 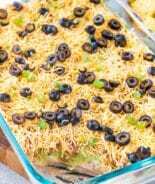 This recipe is horrible, don’t bother making it! I followed the recipe and instructions to a T and it was an inedible failure. It’s WAY too salty, and the liquid does not reduce enough which made it a soupy mess. I am really mad that I wasted $8 worth of shrimp on this. 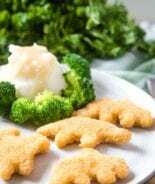 I even tried adding in some steamed broccoli to balance it out and it was just awful. My husband and my daughter both could not eat it. I should’ve read all the comments first. Way too much soy sauce and way too salty. I had to whip up something else for my family to eat. 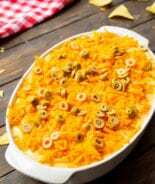 This is good quick recipe. There are a few things you can do to clean it up: use Coconut Amino’s instead of soy sauce and use 1 cup low sodium chicken broth with 1/2 cup water. Thanks for a solid weeknight addition to our house! then just put a bit of oil into a large skillet, add the shrimp, fry a little or more (it depends if you have raw shrimp or precooked unfortunately like me), add the marinade sauce, let it cover the shrimp and thicken, add the quinoa and it is ready, you can add parsley with it. You can also make double the sauce. 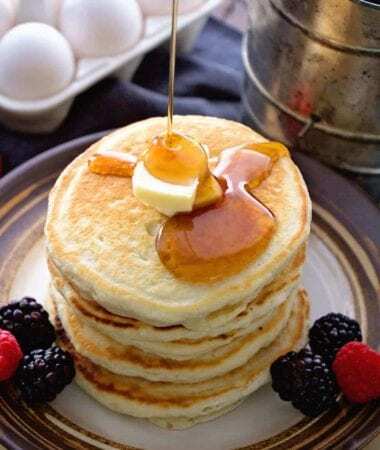 🙂 It is seriously delicious! Bon apetit! Looks great, but I fear you have overcooked the product placement and oversalted the recipe! My husband LOVES this zesty sriracha shrimp quinoa. Even I enjoy it, and I am not a big fan of shrimps.